Rosenth­al, C. Caitlin. (2018). Account­ing for Slavery: Mas­ters and Man­age­ment. Har­vard Uni­ver­sity Press, Cam­bridge MA. I’ve read a num­ber of Caitlin Rosenthal’s aca­dem­ic papers and have been anti­cip­at­ing this book for a while. The book doesn’t dis­ap­point. It cements and builds on her past work, and draws her insight­ful ideas togeth­er. 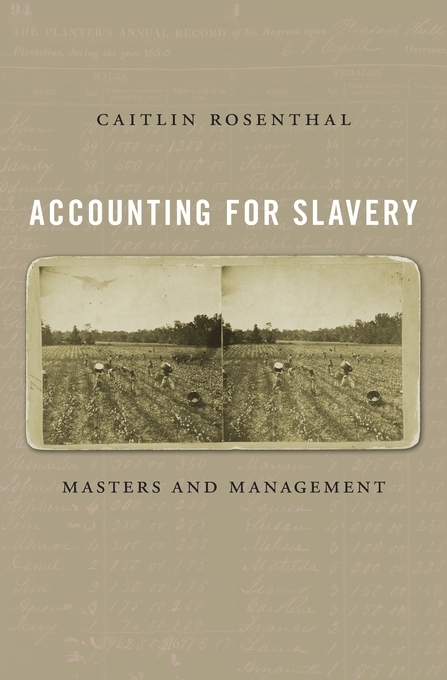 Rosenth­al con­vin­cingly shows how the sys­tems of account­ing used in the (largely) ante­bel­lum South­ern States of the US served to man­age (and mas­ter) slaves, meth­od­ic­ally sus­tain­ing the viol­ence we know too well. I par­tic­u­larly enjoyed Rosenthal’s care­ful exam­in­a­tion of the paper‐based records, show­ing in detail how forms, tables and cal­cu­la­tions objec­ti­fied people’s bod­ies as machinery in a cap­it­al pro­ject, in effect author­ising the bru­tal­ity. What I’d really like to see in any future work is how this line of inquiry ties into con­tem­por­ary slave stud­ies, with its strong and vital nar­rat­ive forms. This will no doubt present a chal­lenge, but one worth pur­su­ing.